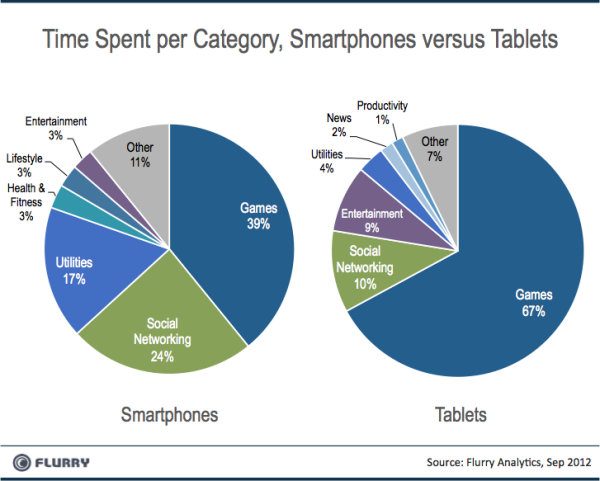 The advertising and analytics company Flurry has released a new study today about the difference between smartphone and tablet usage. The study, while not incredibly revelatory, reinforces several aphorisms about the different ways that tablets are used. 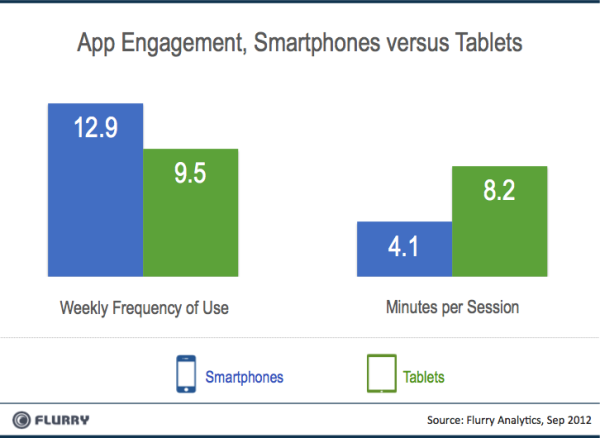 Flurry used a snapshot from its September report, which tallied 6 billion app sessions over 500M devices. A panel of some 30 million consumers that have opted to share their age and gender were used to tally those statistics. Among their findings are that tablet users tend to be older than smartphone users, with a spike in the under 18 crowd for tablets and a huge difference in the 55 and older set. 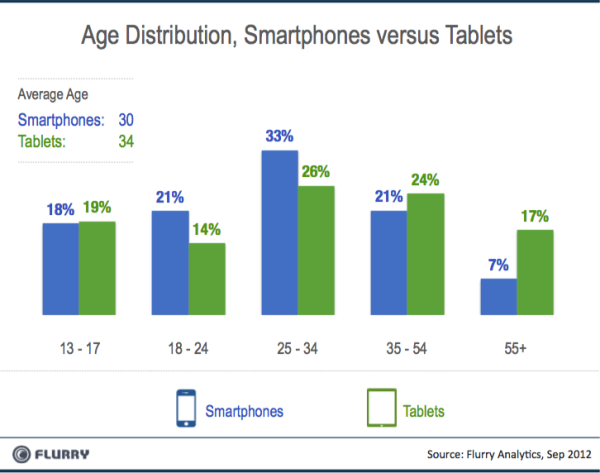 Tablets, it seems, have a far greater appeal among 35 and up than smartphones. The gender split is also interesting, with tablets being used by nearly half women and men, with smartphone usage skewed towards men. The next segment of the study should come as no surprise to those who have been following tablet usage trends. 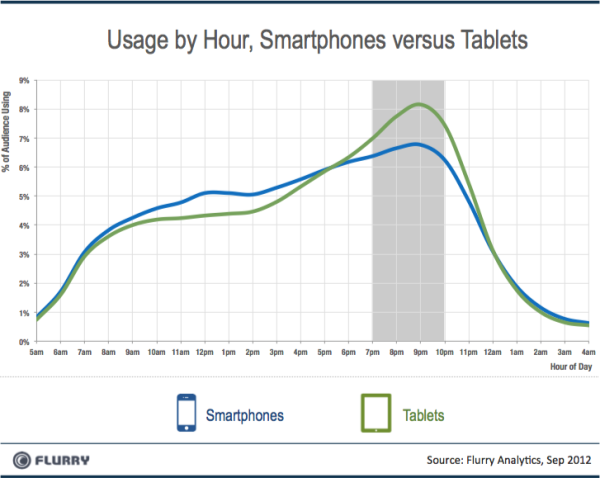 Tablet users continue to use them more than smartphones in the evenings, between 7 and 10PM. This reinforces tablet usage as a companion to television viewing and living-room activities, and indicates that the tablet lean-back experience is more important than ever. As far as the things that people use tablets for, gaming comes in with an overwhelming majority at 67% over other kinds of apps. Social Networking hits 10% and a generic entertainment category places third at 9%. By comparison, smartphones, which are more mobile devices obviously, are used more for social media. The app engagement charts should be an interesting data point for developers. 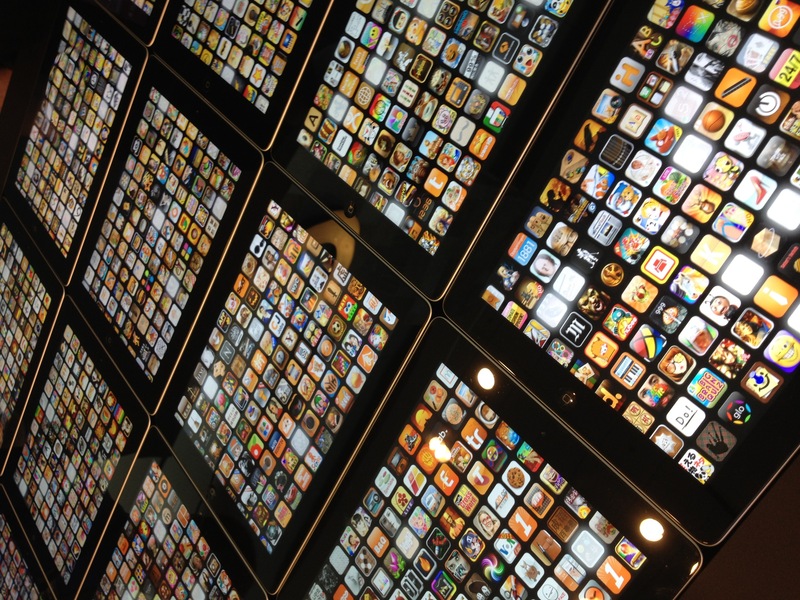 Tablets show double the minutes per app session from smartphones. This means that tablet users are more dedicated to an app once they open it than smartphone users. Spending 8.2 minutes on average in a given app means that some folks are using tablets for extended sessions of things like browsing or movies, but given the above statistics about types of app, these are likely games. None of these revelations are huge, but they do support several of the most common conceptions about the primary users of tablets and what they use them for. Tablet users tend to be older, more affluent people who use them for gaming in long sessions during the evening hours.